The nose is the predominant site of skin malignant neoplasms, and reconstruction of subsequent surgical defects can be challenging. Generally accepted approaches to reconstruction of nasal sidewall include advancement flaps from adjacent reservoirs, namely, cheek advancement flap, nasal dorsum advancement flap, nasal island pedicle flap, and perialar crescentic advancement flap, as well as more laborious and two-stage regional flaps such as glabellar or frontal transposition flaps or even skin grafts, with the latter compromising the aesthetic result given the mismatch in skin texture and color. 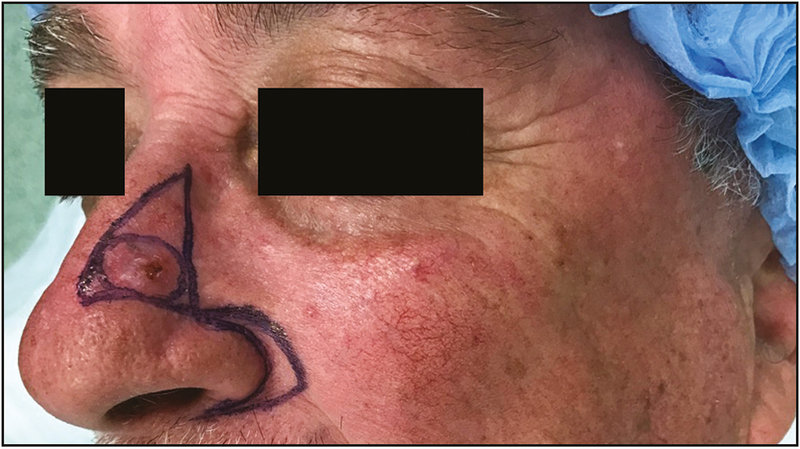 Superiorly to the defect a triangle is placed parallel to the nasal dorsum in order to encompass the surgical defect [Figure 1]. The crescent is marked starting from the inferior edge of the triangle along the alar groove to nasal sill, in order to maintain the concave contour. Usually, the width of the crescent is estimated in proportion to the width of the surgical defect. The triangle and crescent are excised en bloc. Undermining is performed in the subnasalis plane and the subcutaneous plane of the cheek. With the aid of a skin hook pulling on the lateral aspect of the defect, the cheek is advanced medially toward the ala, and a pexing stitch is placed bringing together the new nasofacial junction and nasal periosteum to anchor the cheek, allowing to take the tension off the epidermal closing and prevent tenting. Finally, the defect is closed exaggerating the depth on the alar side in order to recreate the alar-facial groove [Figure 2]. We have used this flap in 16 cases, 11 men and 5 women, aged 40 to 91, with a median age of 67 years. 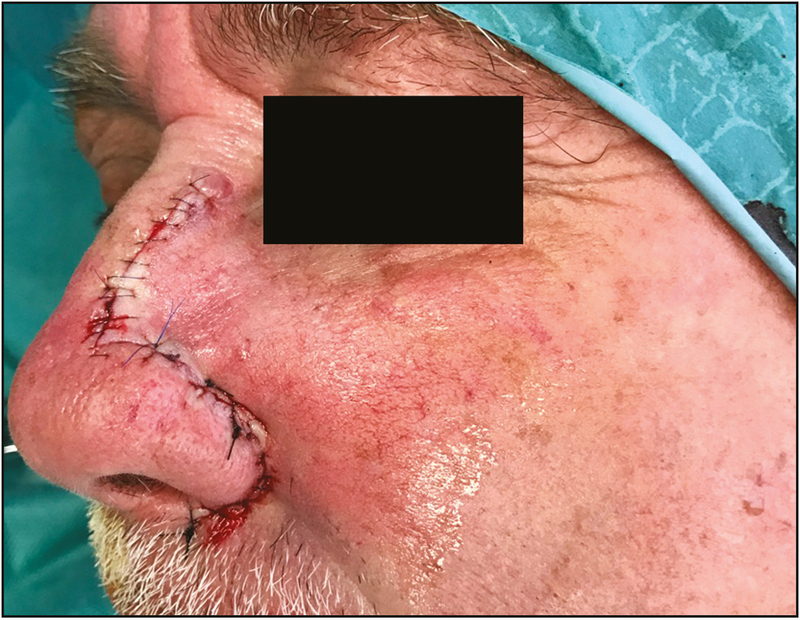 In all cases patients underwent surgical excision for basal cell carcinoma of nasal sidewall. In all cases the excision was complete. The median defect size was 1.6cm, ranging from 0.9 to 2.6cm. Median follow-up was 13 months, ranging between 6 and 25 months. There were neither early or late surgical complications nor tumor recurrences. 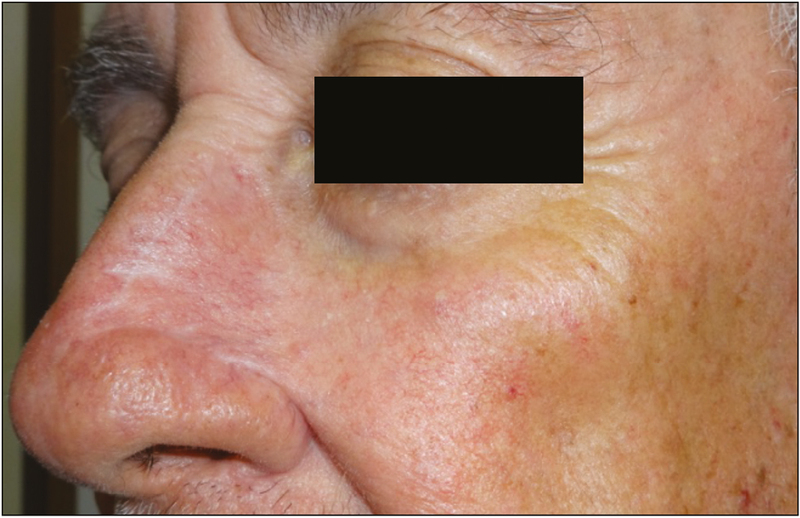 In the longer term, an excellent cosmetic result was achieved in all patients [Figure 3] and [Figure 4]. This flap is best suitable for isolated nasal sidewall defects, regardless of its width or depth, although the best cosmetic results are obtained with defects up to 2cm. Whenever there is violation of subunit borders or another subunit is involved (nasal tip or ala), we prefer to use other types of flaps, such as the bilobed flap, the melolabial interpolated flap, or the frontal flap. There are some possible drawbacks, especially seen with larger defects, such as the pleating of the skin around the alar groove, which could be overcome by further extending the crescent. There is also the potential to cause an asymmetry between the malar regions and nasolabial folds and the loss of the apical triangle, which could be minimized by undermining superficially the cheek over the nasolabial fold, allowing the hypodermis to remain in its original position. The risk of compromising the valve function of the nose is theoretically low since there is no interference with the nasal tip or ala, but it could potentially result from disturbing the position or angulation of the free alar margin, which could be overcome by placing the tension of the suture of the alar groove in a horizontal plane. Although there are other options for nasal sidewall reconstruction, the easy reproducibility and fast learning curve, the versatility in terms of the size and depth of defect, and the respect of the subunit principle make the perialar semilunar advancement flap a reliable and useful tool for the dermatologic surgeon with its most attractive attribute being the concealed scars and minimized disturbance of anatomy of the surrounding structures. Choi JH, Kim YJ, Kim H, Nam SH, Choi YW. Distribution of basal cell carcinoma and squamous cell carcinoma by facial esthetic unit. Arch Plast Surg 2013;40:387-91. Mellette JR Jr, Harrington AC. Applications of the crescentic advancement flap. J Dermatol Surg Oncol 1991;17:447-54. 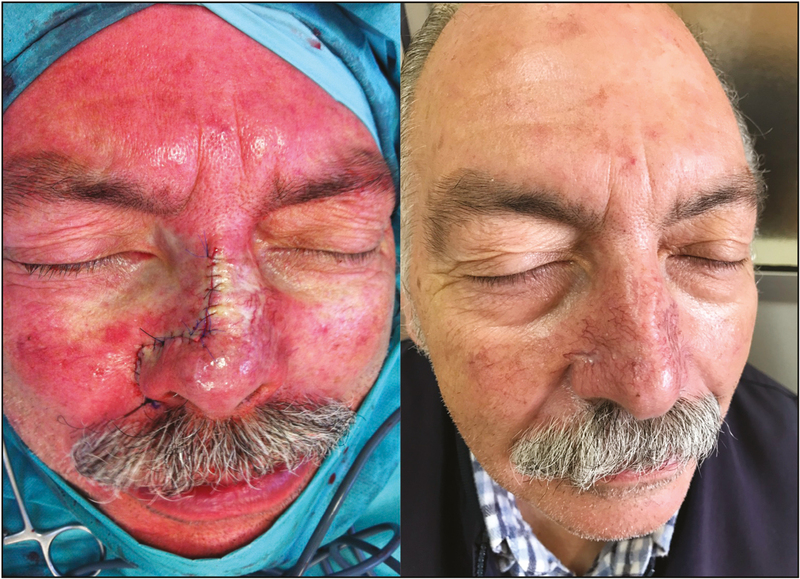 Borchard KL, Gunson TH, Smith HR, Vinciullo C. Pushing the perialar: A modified perialar crescentic advancement flap for the reconstruction of large nasal sidewall defects. Dermatol Surg 2013;39:956-9. Reddy R, Mobley SR. The apical triangle: An overlooked aesthetic facial subunit. Dermatol Surg 2011;37:1343-7.